I can’t believe I turned my nose up at chrysanthemums. It might have been the huge Pom Pom flowers that put me off. Some the size of a head. All stiffly growing in rows, marshalled into line by an army of stakes and string. Not my kind of gardening- and I’d probably have composted any cuttings or plants that came my way. But this year I’ve had a change of heart. My father in law handed over a cutting of a yellow spider chrysanthemum. It’s a plant that has been passed around the family and grown for over 70 years. My father in law is struggling with mobility now and can no longer garden. In fact this year we’ve been running two gardens- theirs and our own. We’ve all worked like demons to keep their immaculate garden up to standard. And the reward has been the smiles and comments from every carer, nurse and visitor to the house. Their glorious flower-and veg- filled garden has been preserved. And so has their much-prized chrysanthemum. I couldn’t be the one to let the side down. I couldn’t let the family chrysanthemum -known as Aunty Doris- die out. So it’s been potted on and watered and fed, and generally fussed over all summer. And I’m surprised to find that I totally love it. It has personality. The glorious sunny yellow flowers open like a sea anemone. It’s fascinating to watch. As the flowers grow, the centres turn a beautiful emerald green. 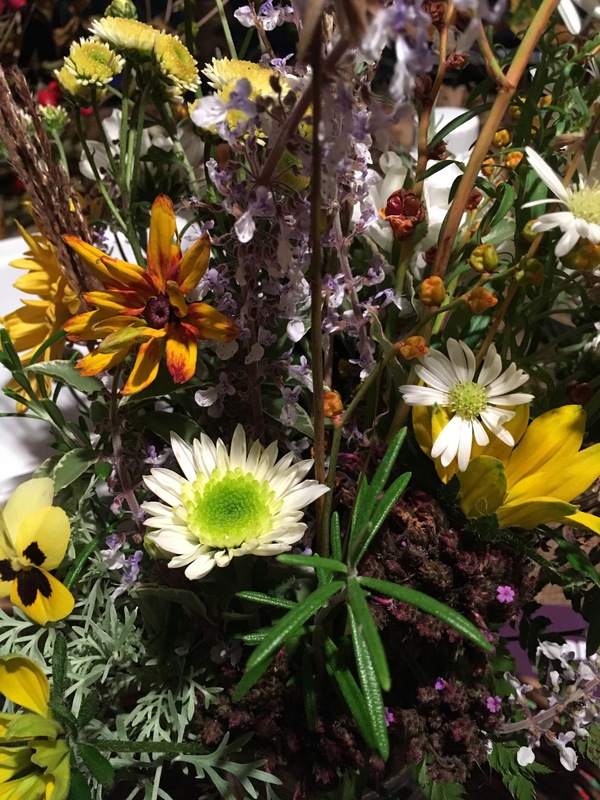 After all that nurturing – the flowers are returning to my mother in law, Joan. Just as her husband of 66 years has always grown them for her, I’m growing them now. I love its rather messy flowers. Beautiful from bud to open flower. Luckily I’ve got lighting in my potting shed, so can create my flower posies for Joan after work. In the posy this week is Chrysanthemum Stallion Yellow and white Swan from Cheshire family nursery Chrysanthemums Direct. Bought as plugs from RHS autumn show. I think they cost around £1 each, and have made good strong plants in a year. I’m an organic gardener, and on my potting shed table is some natural fertiliser I’m trying out from PlantGrow. I’ll let you know how I get on with it. Chrysanthemum Swan in the centre, surrounded by rosemary, verbena bonariensis, pittosporum silver queen, rudbeckia grown from seed, violas and grasses. The orange balls are sprays of seed from crocosmia, and the grey foliage is Artemisia Powis Castle. 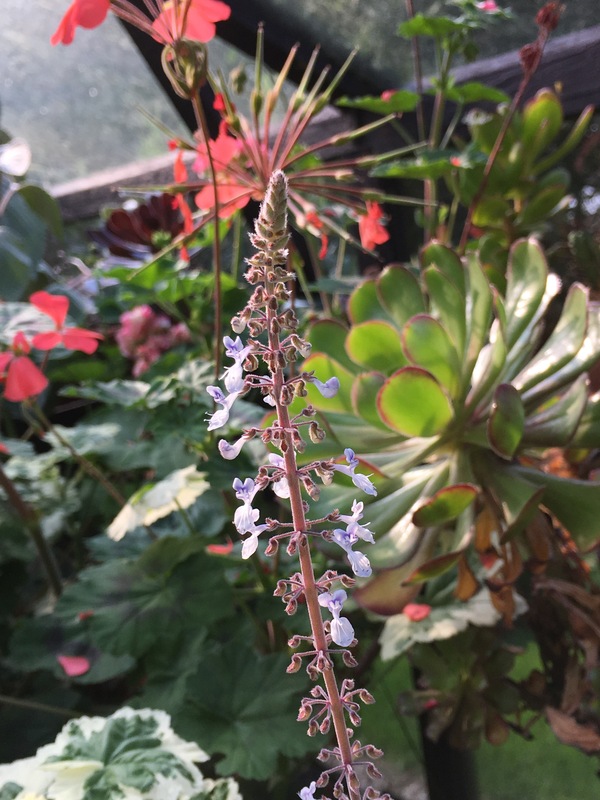 The blue flower spikes are Plectranthus Argentea which is now sheltering in the heated greenhouse for the winter and will provide flowers right through until February. This and many other plants in my greenhouse came from The Herb Nursery at Thistleton. Another family-run business I like to support. The good news is, there’s about 6 more weeks of Aunty Doris chrysanthemums to come. I expect we will even have them on our Christmas table. A reason to celebrate- to be sure. Have you ever tried to keep a family favourite flower or plant in circulation? Thanks as always to Cathy for hosting this In a Vase on Monday meme. Do take a look and see what gardeners around the world are growing. 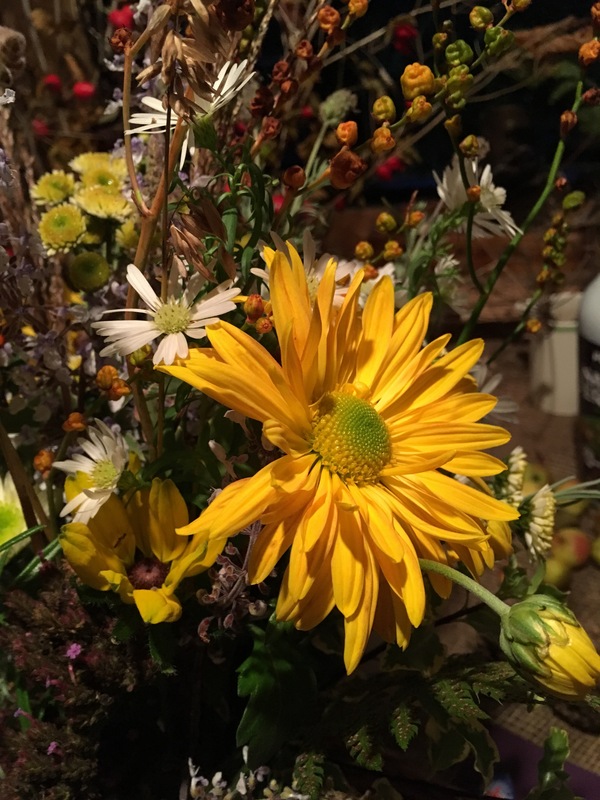 A lovely bouquet and a lovely story. It certainly is a dramatic flower. I have a good friend (20 years older than me) named Doris so I would vote in favor of carrying on with her namesake. Lovely color combination. I would invite Aunty Doris to stay in my garden. I also tend to turn my nose up at chysanthemums, but you’ve got some nice ones there. A beautiful bouquet, Karen. I think ‘Aunty Doris’ is pretty special! ‘Aunty Doris’ is very jolly, a bit like a sunflower it makes me smile. I like Chrysanthemums with green centres, I have a white one that is like that. Caring for two gardens is a lot of work but I’m sure your FIL appreciates all the love and care you’ve put into his garden. What a lovely showing in November! I love the delicate blues of the Plectranthus. It must be splendid to have a “family plant”, especially such a good bloomer. Unfortunately gardening skipped a generation in my family, but I can’t but think of my wonderful grandmother whenever I grow (and smell) the classic, mid-century roses she grew. I think that alone will keep them in my gardens for many years! Yes, chrysanthemums are much underrated. I can’t believe I dug up my one pale bronze small-flowered plant from the plot to make way for annuals. 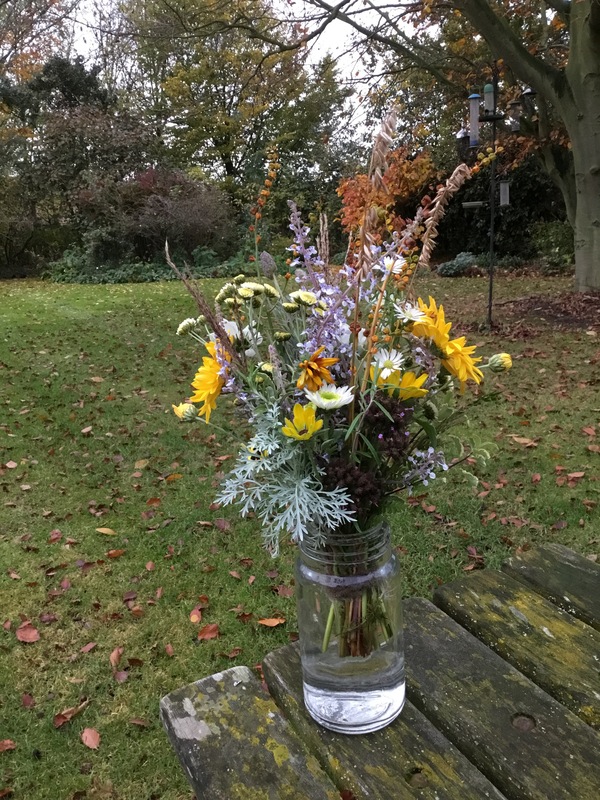 Your jar of flowers looks so pretty photographed in your autumn garden. I looked after my parents’ garden for years and after they died it made me think I could cope with a second home and garden, which didn’t work out for me. On the subject of organic fertilisers, I make comfrey tea which I use at the plot and at home for roses and Clematis and potted agapanthus. Forgot to say- we’ve thought about a second home somewhere by the sea. But I think I would always be drawn back to here. In fact whenever I am away, I’m always thinking of home. I’m not a good traveller. I’m better in my home surroundings. I tend to make the world come to me. Rather than me going out into the world. I can see Aunty Doris is a heart stealer, no wonder it has gotten under your skin. I have a few special plants passed from friends, but none from family. I do, however, have lots of lovely memories of my maternal grandparent’s farm. [D] Chrysanthamii (?!) are so varied. Don’t like one? No worries, something completely different will jump out and surprise you sometime, somewhere! 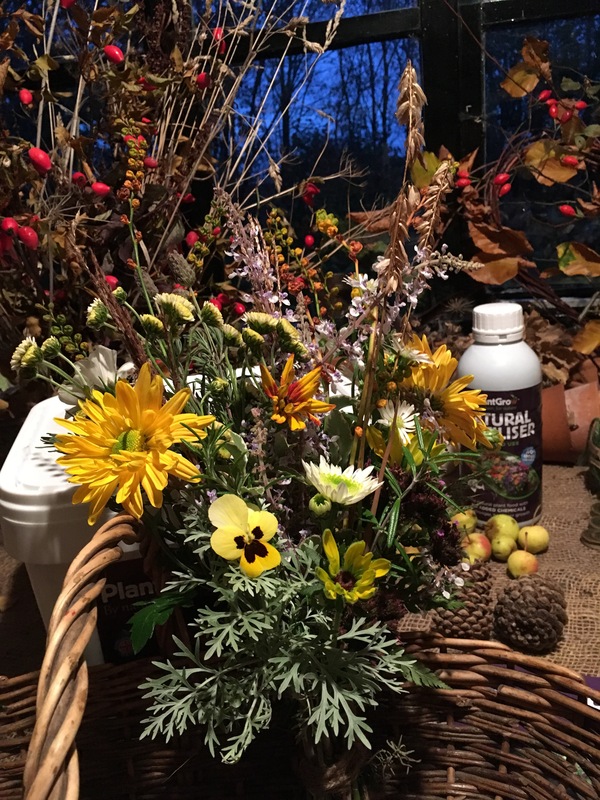 Such a fresh bouquet, you would not say it is the end of autumn! 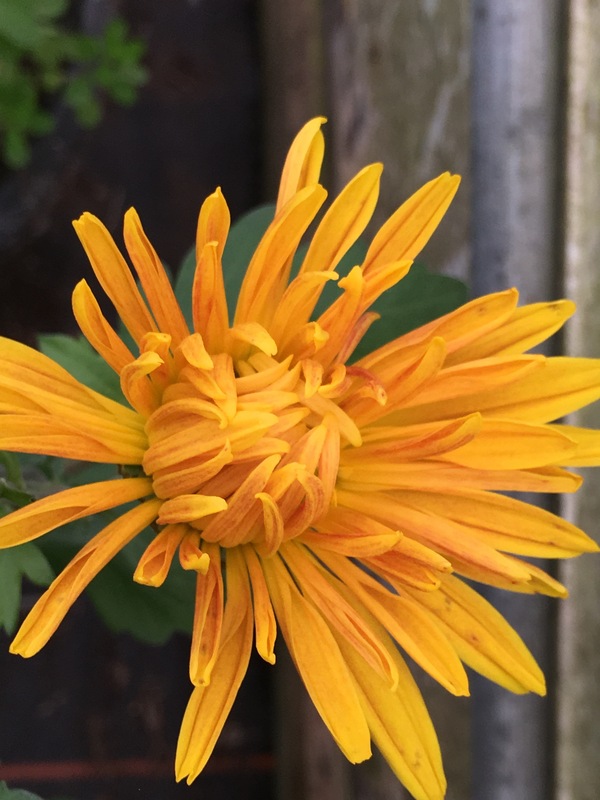 And the story of that Chrysanthemum is lovely, I have done the same with some plants, trying to preserve a family tradition. There’s such lovely stories coming out of people trying to preserve precious plants that their family grew and loved. Heartwarming. I take delight in trying to find flowers in the garden 12 months of the year. Some weeks it will just be a bunch of snowdrops with a few crocus and Iris reticulata wrapped up with raffia. Thanks for your kind comments. All the best. Karen. 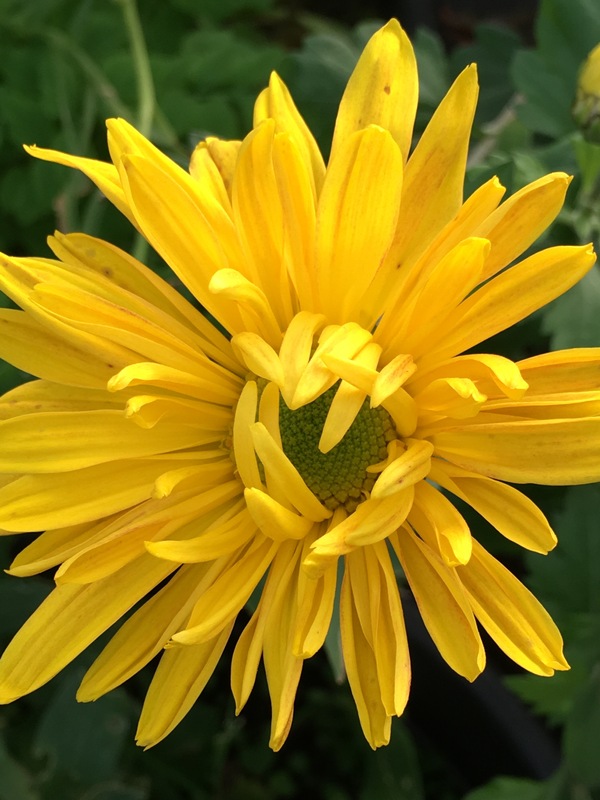 And somehow Auty Dorris doesn’t look like a typical chrysanthemum – or what we have in our minds, that is. She is really rather sweet, and the white and silvery emphasis of other blooms and foliage makes for a gentle rather than brash vase which yellow blooms can sometimes be. I think you are one of several bloggers who are gradually changing others’ opinion of chrysanthemums. ‘Family plants’ I have are what is probably Geranium magnificum and a pulmonaria, both of which have been through various moves over the last 40 years. It does seem to be the year of the chrysanthemum. Aunty Doris would be so pleased to know that she’s on trend. I love the idea of plants being taken from one garden to another for so many years. Speaking to other gardeners, plants have a lot more associations for them than just being pretty. My post on violas for example reminded one reader how her mum would always make her birthday cakes decorated with edible violas. Such precious memories. Thanks for your comments. I am slowly being converted to chrysanths too. Aunty Doris is rather lovely. So beautiful. These flowers always remind me of my mum. You are doing a great job and I am sure you are greatly treasured. Now Aunty Doris is a stunner, how could I not love her! I may not have any special plants to be kept going for someone but I do have lots of plants that have come from cuttings from other friends or family gardens. All make me think of that person and are therefore special. Hello Karen, I’ve just discovered your blog and it’s a great read with some lovely photography. The idea of keeping a plant going through the family is such a lovely one. We have never consciously done this, but come to think of it my Mum did take some cuttings from a hydrangea in my late Grandmother’s garden, and you’ve inspired me to take some cuttings from the resulting plants as a way of keeping her close to me in my garden. I love how gardening can often hold such strong memories of our loved ones. My eyes were hungry for these. 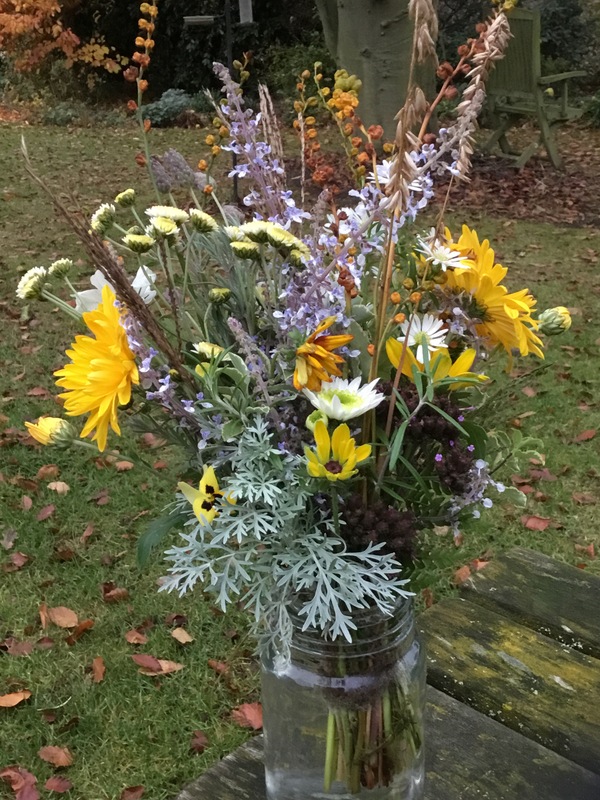 Winter has yet to officially begin and I find even a photo of a fresh garden picked bouquet has me sighing. No winter gardening here. There were three days after a very, very late hard freeze where there was a scramble to get straw down before the snow flew late in November. That was gardening but I already miss caressing the chrysanthemums in my tall front planter on my way to start my day. I have my house flowers/plants/orchids/bulbs…not the same. They are life jackets keeping my soul afloat.